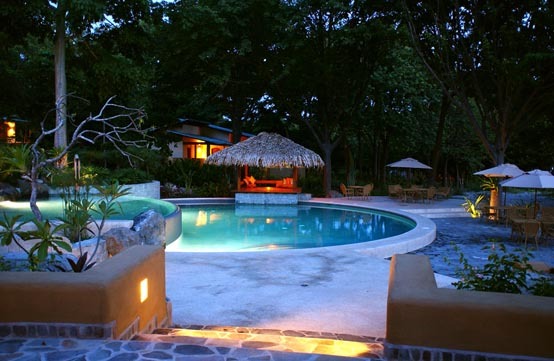 The Florblanca Beach Resort is easily the most luxurious hotel in the Malpais-Santa Teresa area. The beautifully designed and decorated villas spread towards the shoreline and throughout the resort's lush property, where guests will find a restaurant and bar, yoga facility, spa, swimming pool and more. 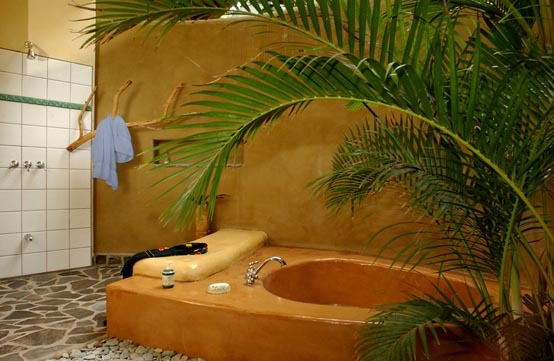 At Florblanca, the tropical meets the opulent, and guests will find it easy to sink into relaxation and pleasure. 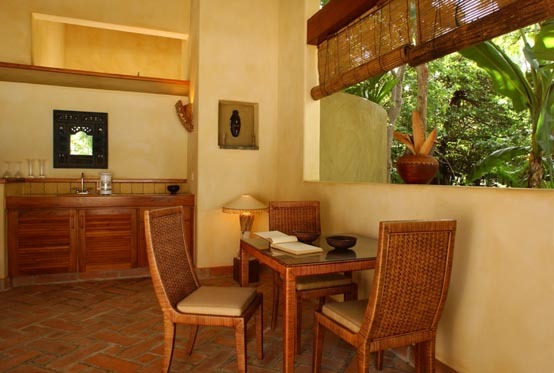 The individual villas are open-air affairs with verandas and sitting areas that stretch into the resort's gardens. 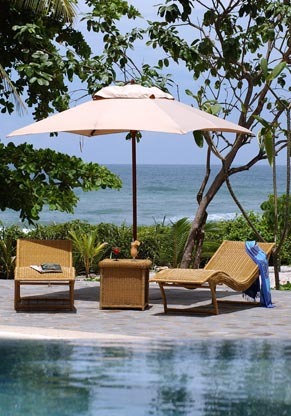 Here, guests can lounge in hammocks and along comfortable sofas while taking in breathtaking views of the Pacific Ocean. 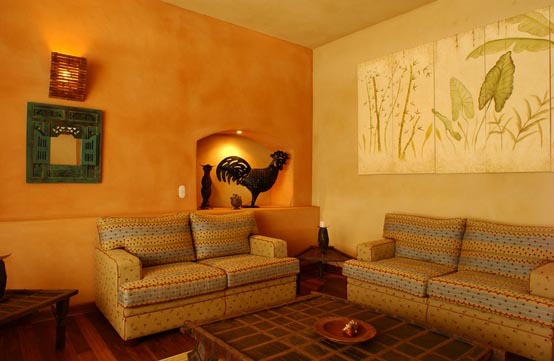 The indoor areas fuse Latin, Asian and African influences in the artwork and architecture. The master bedrooms have comfortable king size beds, while the two-bedroom villas have an additional room tha's equipped with two twin size beds and a daybed. Outdoor rain showers and soaking tubs provide guests with an unbelievable bathing experience, while air conditioning keeps the entire indoor area cool. Florblanca's restaurant features a creative fusion of cuisine in the Nuevo Latino tradition. The open-air restaurant hugs the beach and offers food that is as enticing as are the surroundings. 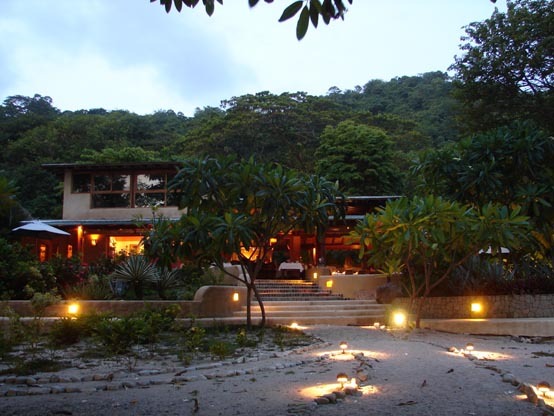 There is fresh seafood, large salads and lamb, chocolate souffle, Costa Rican coffee and more. The restaurant's bar has a huge collection of beers and liquors and access to a large wine cellar. For relaxation, guests can visit the spa or swimming pool. Suspended over a peaceful series of waterfalls, Spa Bambú offers a selection of body treatments, facials, wraps, rubs and scrubs. There is a seaside, open-air yoga studio that offers free yoga and Pilates classes, as well as an air-conditioned fitness room where guests can work out. 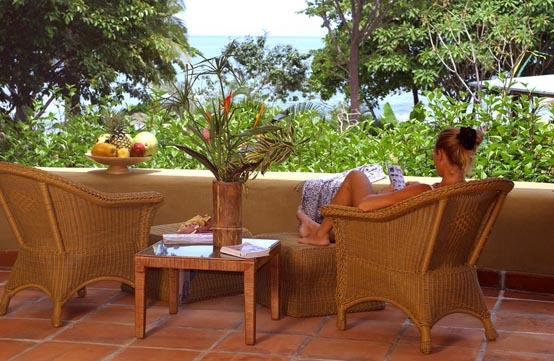 This hotel provides one of the few opportunities in Costa Rica to enjoy luxury while still preserving the sleepy, small town feeling of Malpais-Santa Teresa. 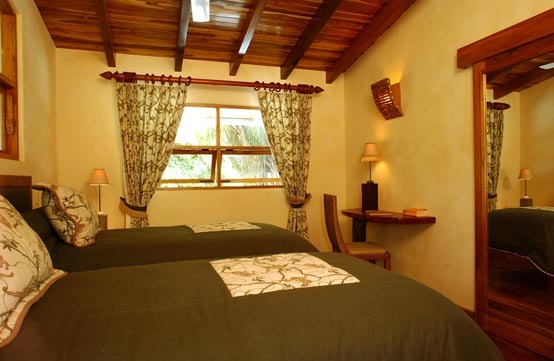 Florblanca is perfect for a romantic trip, a relaxing getaway, or an unforgettable honeymoon. All accommodations have private hot water bathrooms, oceanfront verandas, outdoor living rooms, air conditioning, cable TV, and hammocks. 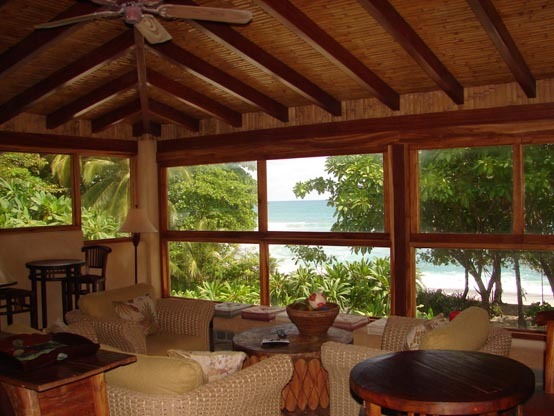 Deluxe One-Bedroom Villa – these villas have one bedroom, one bathroom, and full ocean views. The bedroom has a king size bed. Each villa can sleep three people. Deluxe Two-Bedroom Villa – these two-story villas have two bedrooms, two bathrooms, and full ocean views. There is a king size bed in the master bedroom and two twin beds and a daybed in the second bedroom. Each villa can sleep five people. Superior One-Bedroom Villa – these villas can sleep three people and have garden views. 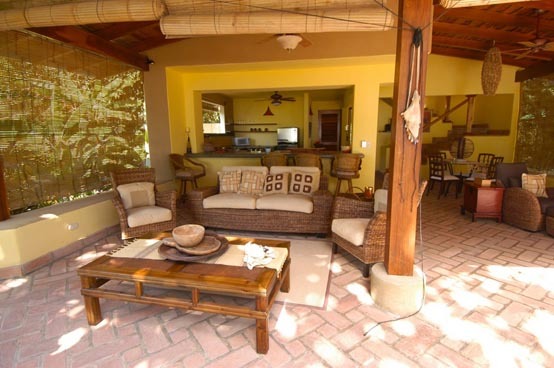 Superior Two-Bedroom Villa – these villas can sleep five people and have garden views. Premium Honeymoon Apartment – this luxury two-story apartment has one bedroom and one bathroom. There is a king size bed in the master bedroom and a Jacuzzi in the bathroom. Additionally, this apartment has a kitchen and the option of having a personal chef. It can sleep two people and is very close to the ocean. 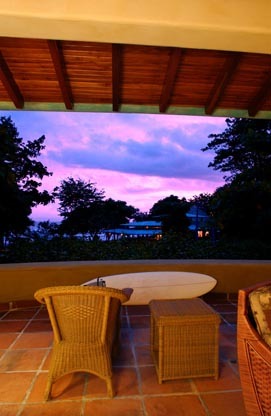 Surf House – this house has three bedrooms and one bathroom. 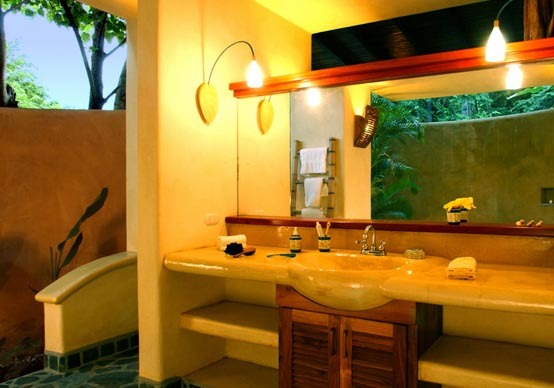 The bedrooms have doors that open onto the beach, and the bathroom has a sunken outdoor bathtub. One bedroom has a king size bed, another two twin size beds, and the third two single daybeds. This house can sleep six people.